Perhaps I am a bit of a contrarian but I am not as high as most experts are on the overall strength of the Toronto Blue Jays current batch of prospects. The system is probably in the best shape it has been in quite some time and Alex Anthopoulos has done a masterful job of restocking a cupboard of prospects that was once considered a laughing stock. But I am just not that convinced that it will ultimately produce any potential star players and there isn’t one guy that I feel is a must have, outside of Brett Lawrie. The list is deep, which is good and I hope if a potential young cost controlled player becomes available (like a Justin Upton) the Jays wouldn’t hesitate in cleaning out the system a bit to fetch a nice asset. But depth doesn’t excite me, and after the top two (Brett Lawrie and Kyle Drabek) the list really goes downhill in my opinion. Even the top two names that have far and away the most potential of the group can leave bit of a sour taste in your mouth. It’s not to say that any prospect out there is a sure thing, but there are a lot of other teams who have a more exciting basket of potential impact players. The Yankees have Jesus Montero knocking on the team’s door, and further down their list have extremely promising arms like Dellin Betances, Manny Banuelos and Andrew Brackman. Not to mention a young catcher named Gary Sanchez who would likely rank 2nd or 3rd on the Jays list. I just don’t see a Jeremy Hellickson, Aroldis Chapman, Carlos Santana, Mike Stanton, Starlin Castro or Domonic Brown type in this group. Brett Lawrie is a naturally gifted athlete who just happens to play baseball, and play it well. The kid has moxie and tools that rate off the charts with his hit tool rating the best. Currently a line drive gap power hitting machine a lot of those doubles should eventually turn into long flies and Lawrie could be a high 20s HRs type of player. Drafted as a catcher by the Milwaukee Brewers, he was quickly switched to second base at his request and the biggest question mark surrounding Lawrie isn’t if he can hit enough it is where is he going to play on the diamond? Most feel a corner outfield spot will be his eventual landing spot and the kid does come with a few warts. Lawrie while highly touted has shown immaturity and is on his second organization before reaching the ‘AA’ level. He refused an assignment to the Arizona Fall League this year and decided he would prefer to be a second basemen as opposed to attempting to play catcher for the Milwaukee Brewers. The reviews are mixed if Lawrie can handle a middle infield role and he has already been shifted to third base to ensure a speedy road to the major league level. The kid is young, only just turning 21 in January/2011 and judging any of his behaviour without thinking of how I acted at the same age would be short-sighted so I am willing to let bygones be just that. However, playing a corner infield spot means his bat is going to have to be that much more impactful and power is the hardest skill to project and normally last attribute to arrive. He is cocky, confident and seemingly brash and I like that, posting a .361 wOBA as a 20-year old in AA might do that for you. Brett Lawrie won’t be an average ballplayer if he makes it I think he makes it big and if he doesn’t I don’t see him even in baseball in five years. I am expecting an impactful, solid offensive career for the kid and I think he is the Toronto Blue Jays best hitting prospect to come along in years. He is our top prospect as a potential top or middle of the order hitter who can play every day, hopefully at a premium position like the keystone corner. Second on the list is Kyle Drabek who for me is one of the most underwhelming “top” pitching prospects in baseball. Don’t get me wrong I think he could still develop into a solid #2/3 starter but the talk of a potential ace is a bit of a reach based on the numbers he has been putting up in the minor leagues. In particular the mediocre to poor minor league strikeout numbers are disturbing. Of course not everybody can be Stephen Strasburg or Clayton Kershaw coming through the system in terms of strikeout numbers but it is a great way to gauge the pitcher’s overall stuff and how they project in terms of future major league success. I hope for the Jays sake Drabek proves me wrong but he is certainly not taking a typical path to stardom. Besides 61.2 IPs in ‘High A’ ball (as a 22 year old in 2009) where his K/9 was 10.8 the overall minor league resume is lacking. I am sure some pitchers have gone on to solid careers with mediocre minor league strikeout numbers but the probability isn’t great and the number of examples isn’t plentiful. For a right handed starter to succeed without high strikeout numbers he would need to have extreme groundball tendencies and play in front of a solid defence. Drabek has improved in this regard as his groundball ratios have improved over the past two seasons. A must inclusion for Toronto in the Roy Halladay trade, Drabek is being counted on to develop into a big time inning eating starting pitcher. I was holding out hope that the Philadelphia Phillies would have panicked and offered their top prospect in toolsy outfielder Domonic Brown and it is a bit worriesome that Drabek’s name was being thrown around more than a few times for such a highly touted prospect. If Drabek were a lefty I’d be more optimistic but at this point I see a solid #3 starter who will give us innings, a 6 K/9, 2.5 K/BB and a FIP in the low to mid 4.00s – very solid but not ‘ace’ like. Alex Anthopoulos did well to ensure Drabek was included in the deal that sent the best pitcher in baseball out of Toronto and the future is still very bright for the son of Doug Drabek. 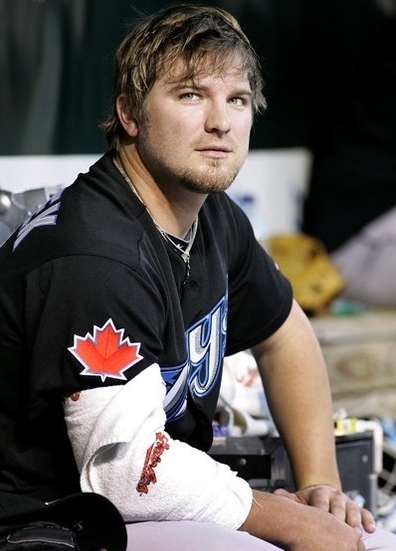 Kyle Drabek possesses a very solid fastball and can hit the mid 90s on a regular basis so there is room for improvement going forward if the secondary stuff can improve and help him miss more bats. This is a guy who could end up making me and this scouting report look very foolish with only a few tweaks and subtle improvements. After all, he already went through TJ surgery so we should cut him a bit of slack I suppose. Well, those are the two best in the system and after that I feel it drops off dramatically. Here is the best of the rest as we rank 3-10. Drafted out of Georgia Tech in the recent 2010 MLB Amateur draft the consensus around the world of scouting is that McGuire was an excellent selection who possesses a crafty 4-pitch arsenal that projects to be a workhorse type mid-rotation guy. I think the ceiling here is a poor man’s Matt Garza. A solid, exciting name but a guy who has never even thrown one professional inning yet he ranks near the top of almost all of the most respected Blue Jays prospect rankings. 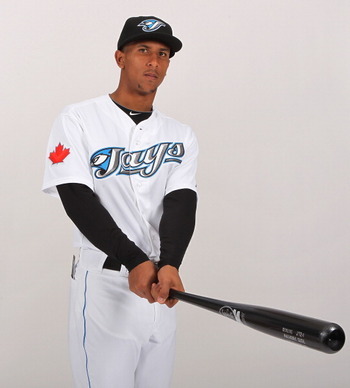 The Jays currently have a plethora of solid young catching prospects and I feel the 20-year old Venezuelan Perez has the most upside of all of them. A potential 10-12 HR guy who can play strong defence and is a strong athlete. Has shown solid patience in his young career at the plate and he could profile as a solid mid to bottom of the order hitter with a bit of pop. Acquired in the Scott Rolen trade from the Cincinnati Reds Zach Stewart’s stock dropped a bit in 2010 as his K/9 plummeted to only 7.0 in 136 ‘AA’ innings as he posted the worst FIP of his career at 4.18. Stewart will turn 25 years old this summer and the time for him to arrive is now, another guy who likely wouldn’t crack many teams’ top ten lists. There has been talk he is best suited for a late inning relief role also but I think the Jays will exhaust all possibilities of becoming a starter before that happens. I am higher on Anthony Gose than probably any other evaluator so far this offseason but I don’t understand the trepidations with Gose who at worst will provide gold glove calibre defence at a premium position and steal a few bases. However if the bat develops into even slightly below league average we are talking about a potential 5.0 WAR player who is still only 21-years old who just posted a .363 wOBA in 113 PAs for the Jays ‘AA’ team. Gose athleticism ranks off the charts and the only question mark with him is the plate discipline and overall bat tool. Acquired for 1B Brett Wallace I’m rolling with him and I like this type of talent, very toolsy. Probably the most complete all-around game of the Jays catching prospects, D’Arnaud has the potential to develop into a plus defender who would only need an average bat to provide decent value to his club. I think he should develop into a useful hitter but a guy who will always bat near the bottom of the lineup but he is still only 22-years old and has time to continue his development. This guy ranks all over the place on various lists, as high as #3 on Marc Hulet’s Fangraphs ranking while down to 8th on Baseball America’s. I feel the general consensus regarding Arencibia is ‘meh’ and I feel the same way. Already turned 25 years old Arencibia had virtually fallen off the prospect map after a horrible 2009 where he posted a 236/284/444 slash line in 500 ‘AAA’ PAs. When the team moved to the little league park in Las Vegas his numbers subsequently jumped with them. I am not buying it and I don’t think he ever hits enough to justify the worst facet of his game, and that is game calling and defensive skills. Terrible plate discipline, bad defense and one park/league infused season justifies ranking him so low. OF Jake Marisnick – toolsy, big ceiling, big risk. SP Asher Wojciechowski – between him and scrabble the Jays are doing their best to empty ink cartridges. Strong upside from the College right hander. SP Aaron Sanchez – strong high school righty, just drafted in 2010. SS Adeiny Hechavarria – suspect bat tool but legit glove. OF Eric Thames – the bat is exciting. SP Chad Jenkins – stock fell a bit with pedestrian K-rate in advanced ‘A’ ball. SP Adonis Cardona – top 16-year old Venezuelan signing in 2010, years away. 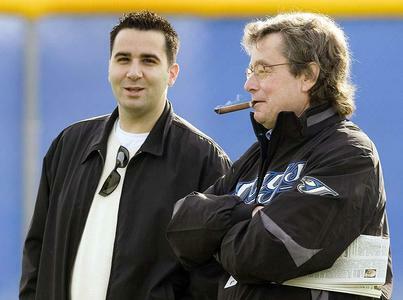 The Jays system has depth again and the Alex Anthopoulos plan and era are in the early stages so I fully expect given him competency that the Blue Jays farm system and draft excellence will continue to be at the very forefront of the plan. Even in 2-3 years a lot of the names will start to look more exciting as they reach higher minor league levels and the system starts to hopefully do its job and churn out big league regulars. Right now though I feel the system is solid but a tad on the overrated side. Most sites do say the Jays have a good crop though none get hugely rated overall compared to the MLB. Maybe it is a case of a quantity over quality. Sickels gave no “A”s, Baseball america didn’t rank any in the top 25 so I think maybe your point is valid. Let’s see how they progress over the next season or so. Gose only turns 21 in August. Which gives you even more reason to rank him as highly as you do. thats freat anthony gose and infielder Montaous Walton are by far two of the Fastest players i have saw play, gose has been in the jays system for a while and has a chance to become a great player, although Walton was not drafted we signed him because of his Raw speed, both of these guys should be great players in the future! Who Can Stop The Great Jon Jones?